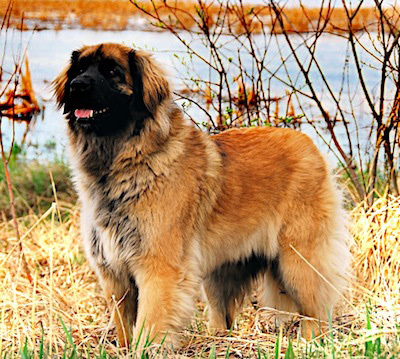 Average Height	: 25" - 31"
Photo Courtesy of : Leonberger Rescue, Inc. This breed was established in 1846 in Leonberg, Germany, in the region of Wurttemberg by the German breeder Heinrich Essing from a crossing of the Newfoundland, St. Bernard, and the Great Pyrenees. Heinrich Essing's goal was to create a breed that would closely resemble the look of a lion. Leonbergers have been owned by many royal families including Napoleon II of France, Empress Elizabeth of Austria, the Prince of Wales, Emperor Napoleon II, Bismarck and Italian King Umberto. In the nineteenth century many Leonbergers were imported to Russia. Like many breeds, the world wars almost brought it to extinction. By the end of World War II, only a few dogs remained. In 1945, several Germans gathered some of the few remaining Leonbergers and re-established the breed. Today the Leonberger has regained his popularity in Europe. The official standard was set in 1949. The first Leonberger was imported to the United States in 1971. This versatile breed has been successful for guarding livestock, search and rescue, obedience, water rescue, tracking and as a family companion. First and foremost a family dog, the Leonberger's temperament is one of its most important and distinguishing characteristics. Well socialized and trained, the Leonberger is self-assured, insensitive to noise, submissive to family members, friendly toward children, well composed with passersby, and self-disciplined when obliging its family or property with protection. Robust, loyal, intelligent, playful, and kindly, they can thus be taken anywhere without difficulty and adjust easily to a variety of circumstances, including the introduction of other dogs. Early and extensive socialization and training with plenty of positive reinforcement and consistent expectations will turn him into a family friend like no other, but without them he's mischievous and destructive. The Leo's high energy levels and intelligence make him a super competitor in agility and obedience trials, and he's also found doing therapy visits and water rescue work. Leos like living in a pride of their own kind, but they get along well with other animals, too, including cats and horses. Because of their great size, they should never be left alone with young children. This is a sensitive dog who dislikes family arguments. Keep your disagreements private or he may try to intervene. The Leo loves being with his people and won't be happy to spend all his time alone in the backyard. Expect to give him about an hour of exercise daily.Take the Leo's size into consideration before bringing one home; this breed needs a family with a yard and an SUV, not a studio apartment and a Miata. The coat sheds heavily twice a year and moderately the rest of the time. On the plus side, his deep bark and huge size are more than enough to put off any halfway intelligent intruder.